We’ve probably all been there at some point (or we will in the future!). Our child wakes up crying in the night. You go in and put a hand on her head to find her “burning up” with red tear stained cheeks. How high is “too high” for a fever? Should I call the doctor or go to the ER? Here are a few FEVER FACTS that can help us stay calm and help our kiddos to weather the storm. FACT: Fevers can be caused by common viruses or bacteria and can last 3-4 days while the body fights off the germs. And still, we often want to know the exact number on the thermometer that should be cause for worry. FACT: The number on the thermometer is not what’s important; it’s how the child is looking and acting. Children often feel tired and cranky with a fever and won’t want to play or eat as much as much as usual. What’s more important than the number on the thermometer is whether the child is able to arouse, sit up and drink some water. FACT: Did you know that the brain and body work together to help fevers caused by infections to typically stay at 104 degrees or lower? Occasionally, fevers can rise to 105 or 106 degrees, which although on the high side, still aren’t dangerous and won’t cause brain damage. In very, very rare cases, a fever might trigger a seizure. Thankfully, seizures caused by fever won’t harm the child (even though they will likely scare us!). While we know that most of the time fevers aren’t worrisome, what can we do in the middle of the night or anytime when our kids have a fever? Kids only need to be treated with fever meds IF they are uncomfortable, which is usually above 102-103 degrees. If you choose to treat for comfort with fever medications such as Tylenol (acetaminophen) or Motrin (ibuprofen), be sure to stick with just one. Alternating the two, or mixing medicines, can lead to dangerous confusion and over medicating. 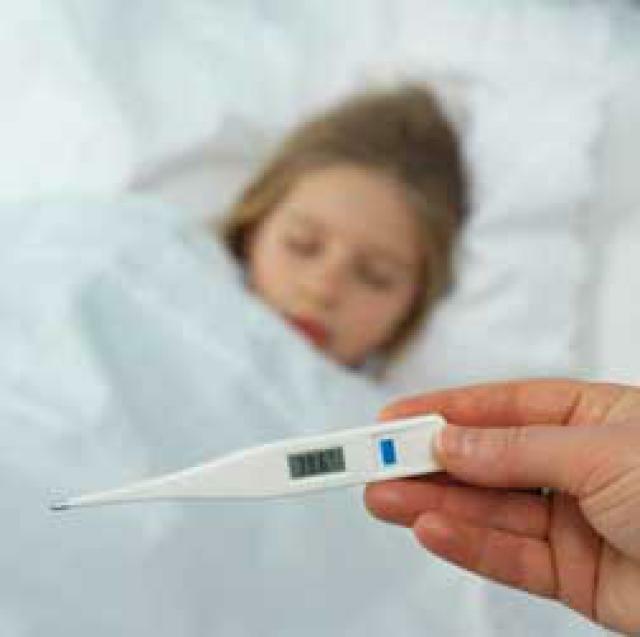 When it comes to fever and any other concern, at Weiss Pediatric Care we caution our families about staying away from “Dr. Google,” the world of medical information available on the internet that often has no basis in science or fact. Dr. Google is guaranteed to scare you in the middle of the night, and just about anytime when you’re worried about your child and are looking for answers. Instead, please check out the “Is Your Child Sick” app on our home page for reliable, factual, parent-friendly information about over 100 childhood illnesses and diseases. You’ll find everything from what to look for, to how to treat at home, to when to call the doctor, and in rare cases…when to go straight to the hospital. Whenever you’re worried you can always call us. We’re available 24/7 to answer your questions, to reassure you, and to provide guidance.